Bagels are one of those foods that I never really thought of making at home. I assumed I could, but I thought that the work required would hardly equal the taste of the bagels that I could so easily buy. I was wrong. So wrong. A couple weeks ago, I was flipping through Nigella Lawson’s cookbook How to Be A Domestic Goddess when I stumbled upon her recipe for bagels. They looked delicious and the recipe was surprising simple. So on Friday, I finally whipped up a batch. Lawson states that the dough in this recipe requires a little elbow-grease. However that doesn’t really describe how difficult it is to work with this dough. The dough isn’t sticky, but it is stiff. If using the dough hook on an electric mixer, don’t leave the room as you may not notice the oily smell of your mixer’s engine as it starts overheating. If you choose to work the dough by hand, then go ahead and skip your arm workout at the gym. I promise it won’t be necessary after you knead this dough into submission. To be fair, I need to warn you that working with the dough in this recipe will at times make you feel discouraged. You may find yourself praying to the Kitchenaid gods to not let your out-of-warranty mixer die. Or, if you decided to knead by hand, at some point you will find yourself cursing under your breath as your arms begin to feel as though they are going to fall off. To be sure, you’ll question your desire to make everything from scratch and wonder why you couldn’t just be happy with the perfectly fine bagels at your local coffee shop. But eventually your dough will be smooth and elastic and the rest of the steps in the recipe are blissfully simple. And then, in a much-anticipated moment, you’ll find yourself biting into a dense and chewy bagel that will make you a bagel snob forever. While this recipe is fairly straightforward there are some things you should know. First, the smallest amount of bread flour required in the recipe is 6 2/3 cups. 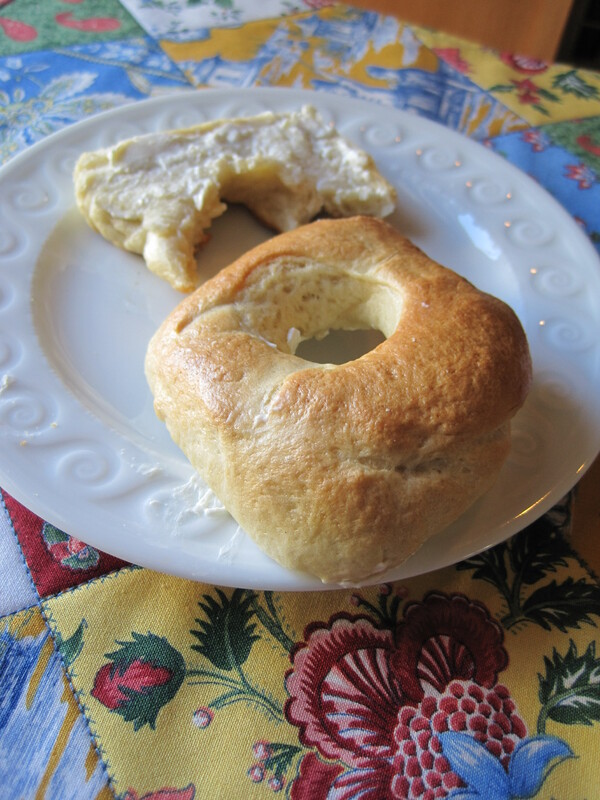 If you can find a way to incorporate another 1/3 cup of flour you’ll get a better bagel. However, you will also find that adding 1/3 cup of flour makes the dough much tougher to work with. Please persevere. It will be worth it. The other trick is in the shaping of the bagels. Lawson suggests making the bagels by rolling out small pieces of dough into ropes and then pressing the ends of each rope together to form a circle. I found that the bagels I made in this way came apart when I boiled them leaving me with delicious, but rather odd-looking half-moon bagels. When I made the bagels a second time, I tore off 4-ounce pieces from the main dough, rolled them between my palms to form a small ball, and then gently pressed them down into a 1/2″ thick disc. I then took a small 1″ circular cookie cutter and cut out the center. The resulting bagels still had that wonderful homemade look, but were more like the real thing! These chewy bagels will disappear quickly. Hopefully your arm muscles will have recovered enough to make another batch! In a large bowl, whisk together the flour, salt, and yeast. Create a well and add the sugar, vegetable oil, and warm water. Stir until the dough is well-incorporated. This will be very tough to do. Turn out the dough on a lightly floured surface and begin to knead the dough. It will be very difficult to knead the dough, but continue to work with it until it becomes smooth and elastic. If you prefer, you can also knead the dough using the dough hook on an electric mixer. If kneading the dough in this way, be sure to keep an eye on your mixer to make sure it’s not overheating or working too hard. 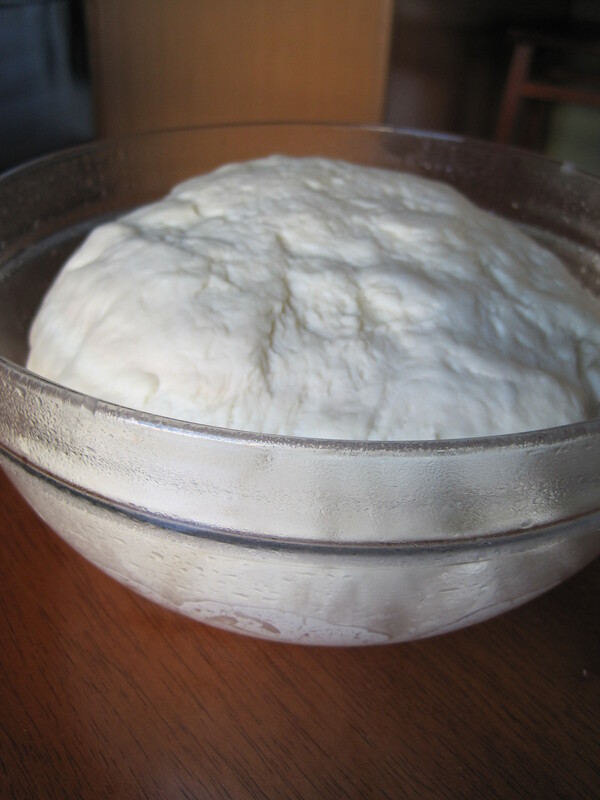 It can take up to 10 minutes to get a smooth and elastic dough using the electric mixer. If kneading by hand, it will take at least twice as long. Lightly grease a large bowl with a little vegetable oil and then add the kneaded dough to the bowl. 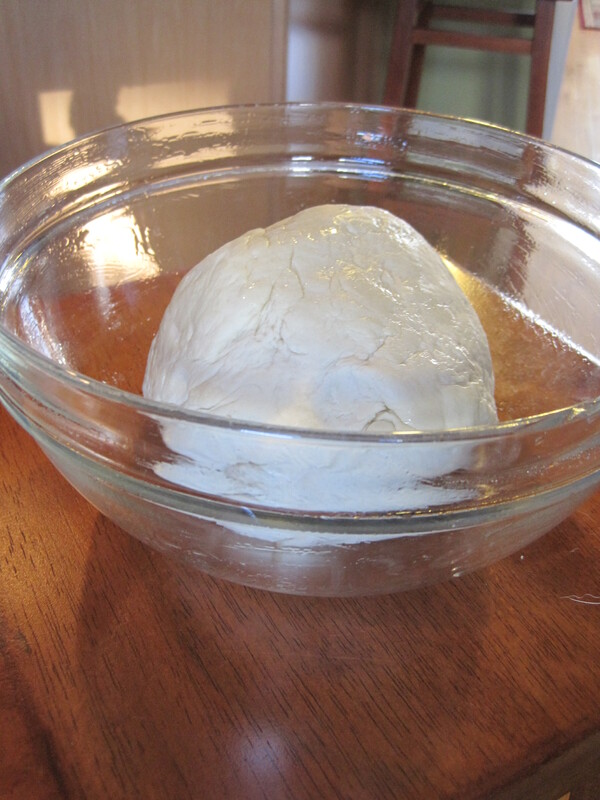 Cover the bowl with plastic wrap and let the dough rise in a warm spot for 1 1/2 hours. After 1 1/2 hours, the dough should be well-risen. Turn out the dough on the counter and firmly press the dough down. Cut off 4-ounce pieces of dough (about the size of a lemon) and roll into balls. 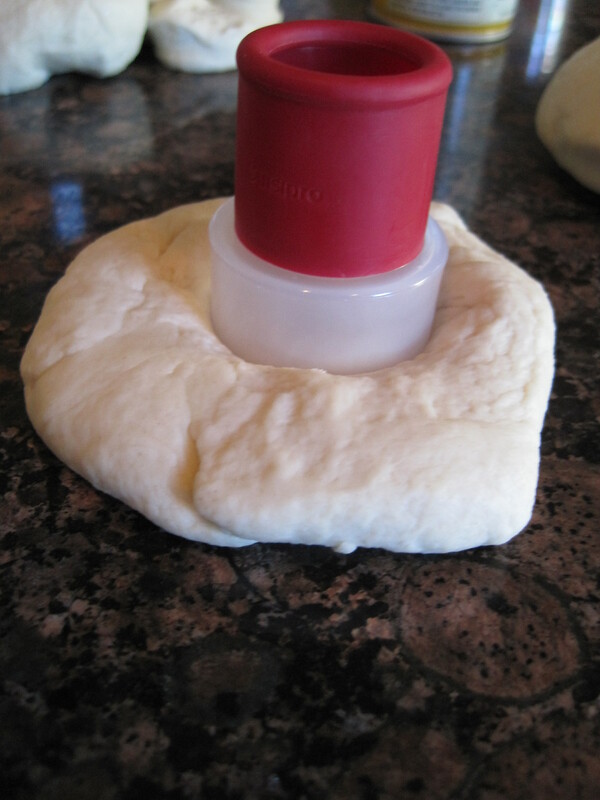 Gently press down the dough into a 1/2″ thick round disc. Using a 1″ circular cutter, cut out a circle from the center of the disk. Place the shaped dough on a lightly greased baking sheet. Once all the bagels are shaped, cover them with plastic wrap and a towel and let them rest in a warm spot for about 25 minutes. Meanwhile, preheat the oven to 500 degrees. Bring a large pot of water to the boil and add 2 1/2 tablespoons sugar to the water. 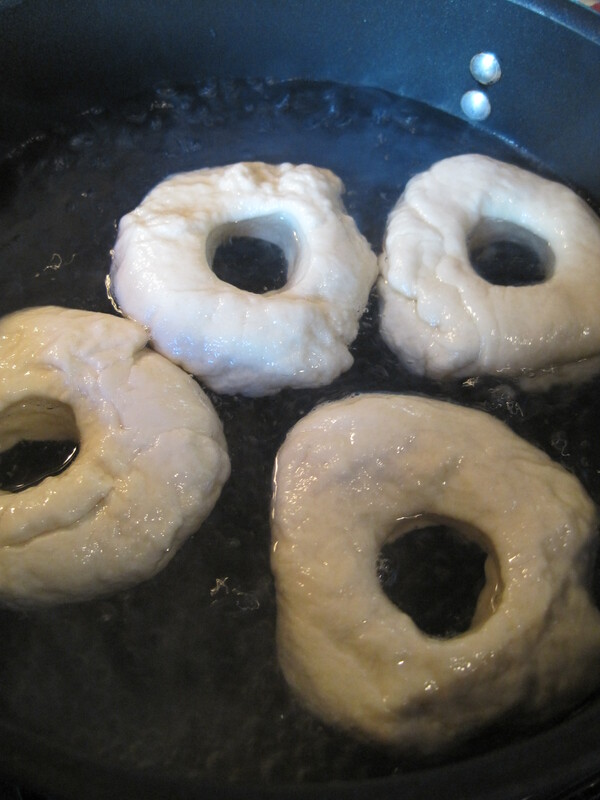 After the bagels have rested, cook the bagels in the boiling water for about 45 seconds on each side. You can comfortably boil about four bagels at a time and tongs work well for moving the bagels around. After boiling, return the bagels to the greased baking sheets. Once you have boiled all the bagels, bake them in the preheated oven for 15 minutes or until golden brown. 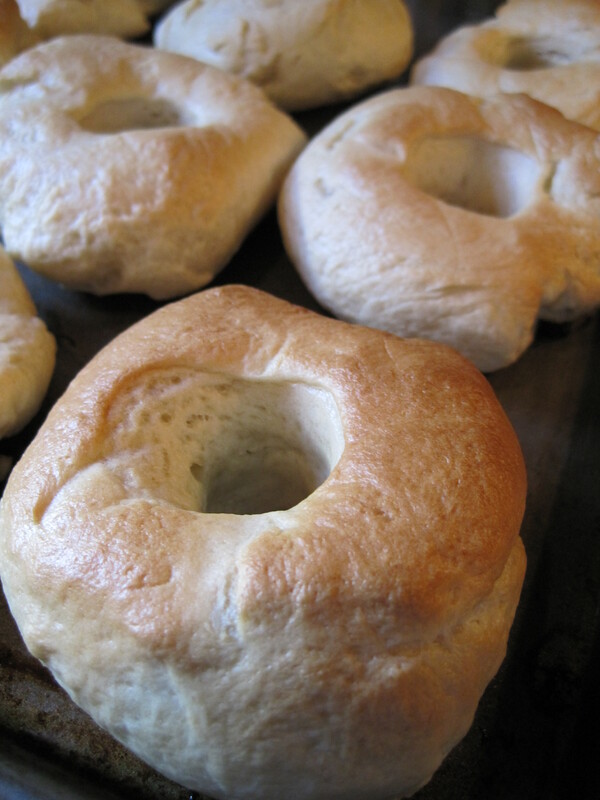 Allow bagels to cool before serving. Bagels can be frozen. Enjoy! is it possible to substitute the bread flour for all purpose flour? You could, but it’s not going to have the same “structure” as it would with bread flour. Bread flour has more protein in it than all purpose does. These look so yummy! I am looking at my Kitchenaid willing it to make these yummy treats for me! 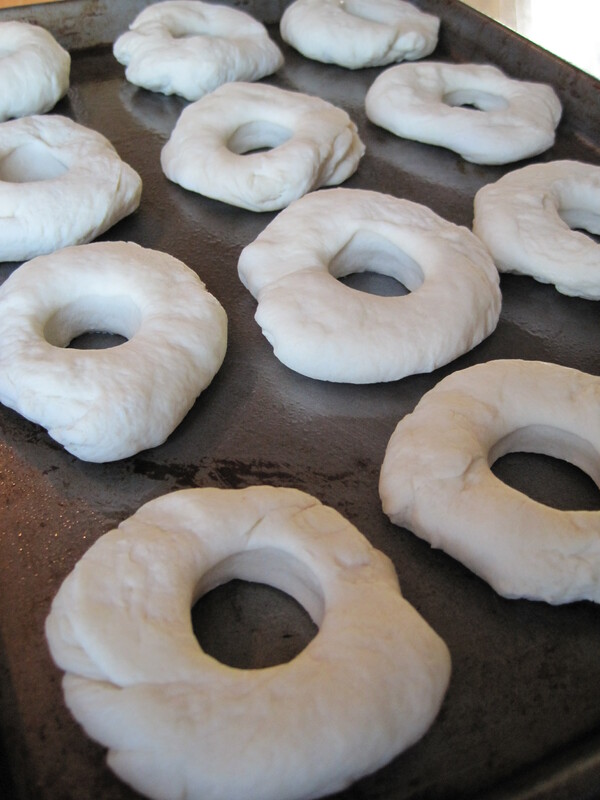 They look delicious…perhaps sometime soon you can take it to the next level for us….HOMEMADE DONUTS!!!!!!!! I am so glad to hear it was a success! Happy cooking!